Our Agriturismo offers various entertainment possibilities – you can swim in our swimming pool, take a healthy walk in the surroundings or just relax and listen to good music. Art and culture enthusiasts can visit the marvelous Villa Romana del Casale, the archaeological excavations in Morgantina, the town of Piazza Armerina with its wonderful Dome or the town of Caltagirone with its precious ceramics. 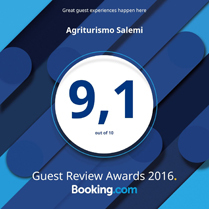 Agrisalemi is strategically located in the middle of Sicily, which enables our guests to easily reach both the beaches near Cefalù and the most beautiful Sicilian cities, i.e. Taormina, Agrigento, Palermo, Syracuse and Catania. We organize small conventions, food festivals, cultural meetings, music events, food tastings and craft fairs with traditional Sicilian products.